Oh, my heart - It just might burst! 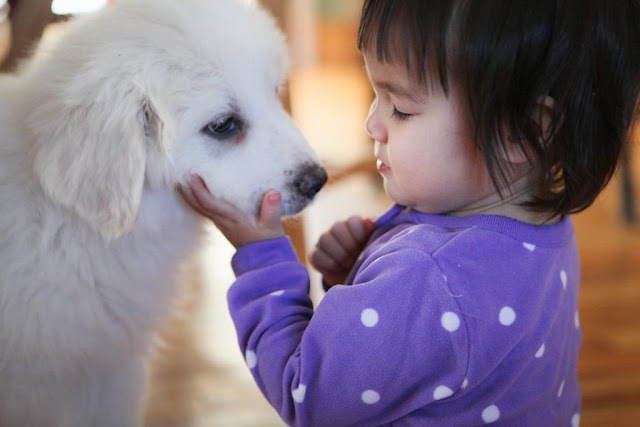 They will have a bond like no-one else in yur family has with the dog -there's a special connection between a dog that has been 'raised' with a baby/todler! They will be best friends forever! what a gift to give your child! My daughter was 18 months old when we got our lab. Even after he had major surgery to remove most of one lung, he refused to budge while she napped on his neck--the only spot that didn't hurt him. He let her sleep for two hours. He peed for almost four minutes when she got up. He is her go-to for stressful times and he always ends up as her head rest. How beautiful for your family to have that now, too!